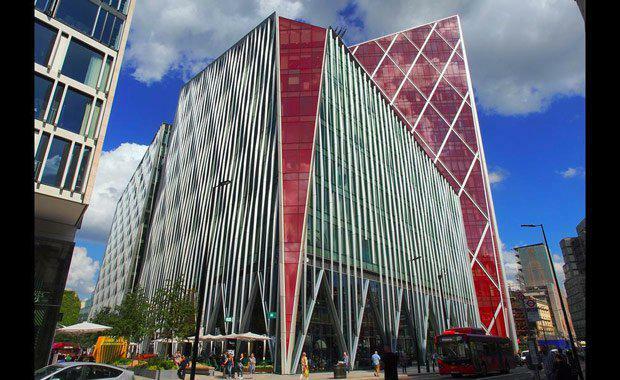 An office development in London central described as a “hideous mess” has been named the ugliest building in the UK. The Carbuncle Cup, organised annually by the UK's Building Design magazine, is a competition to recognise the ugliest new building completed in the past year. This year, the "honouree" was the £380m Nova Victoria building - designed by "serial offenders" PLP Architecture. Located near Buckingham Palace, Nova Victoria is a mixed-use development occupying a whole city block in London, with two office buildings designed by PLP and a residential building designed by another firm. The judges described the building as "crass", "over-scaled"and "a hideous mess". Judge Catherine Croft said, "Nova should have been good as it’s a prestige site. It makes me want to cringe physically. It’s a crass assault on all your senses from the moment you leave the Tube station. "The developer Land Securities described it as "distinct" and "architecturally daring". The development has a pointed peak that reaches 18 storeys-high. The building incorporates a sheer face of red glass criss-crossed with aluminium bracing. Around the side runs a screen of aluminium fins, cut with rippled profiles. At ground level, the aluminium fins form a series of serrated openings. In awarding the Carbuncle Cup, the judges described it as "one of the worst office developments central London has ever seen", and one that "sets a new benchmark for dystopian dysfunction". Previous winners of the Carbuncle Cup include the Lincoln Plaza in the Isle of Dogs, London; and the fantastically named "Walkie Talkie" building in the City of London.